It is not easy to buy Ambergris even for one who knows it well. The business is in the hand of very few people who are ready to throw millions of dollars for really big lots. They control the prices and are very fast in travelling to the finding places with the cash payment. It is a matter of “grab and run”, that often occurs in luxury hotel rooms. It is certainly dangerous to go around with such big amounts of money, and the life of an Ambergris hunter is surely adventurous and romantic. Since years I am trying to sneak into the business without much success. The others are better equipped and the only resource I have is to offer more money than them. 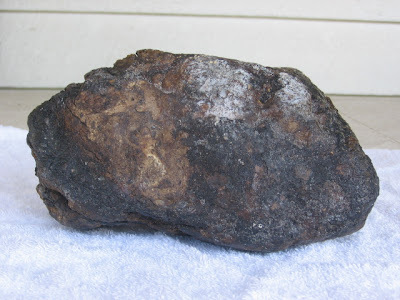 Therefore one should know the price that they offer, and on the other hand it is difficult to buy it too expensive because it becomes then difficult to sell it and you risk being left without money but with plenty of ambergris. The customers are always the same, Guerlain and some of the biggest perfume houses. The Arabs, the Asians and the Japanese are also very big consumers. I have received an offer for a lot of 1,5 kg (in photo) and this is a reasonable size for me. The investment is at my dimension and the lot is a single lump. This is important to me because I have observed that the maturation, that lasts for years, occurs in a better way in big lumps than in small pieces. The problem is that this lot is in Australia and that it is the only country from which the export is prohibited. I know that the French hunters manage to export it. I called the seller in Australia and he also knows that. Probably he had already contacted the French concurrent and his offer was too low. Then he called me for a better one. “Well” I said, “let us do the same, like Crocodile Dundee, after all we are in Australia”. In the meantime I put the photo online. If someone is interested in the Ambergris business let him call me.